Thanks Candy for This Year’s Flyer/Poster! Candy Schell has created most of our logos, fliers, posters, t-shirt designs and banners over the years. We may be a little biased, but we think her work is amazing. Not only is she a creative graphics artist and designer, she is an incredible fiddler who shares our passion for Irish music. And honestly, she is one of the nicest people you’ll ever meet. Thanks Candy for adding another fine work of art to our retreat collection! You always help us show our best side to the public. To view or download the flyer, click on the image on the left. 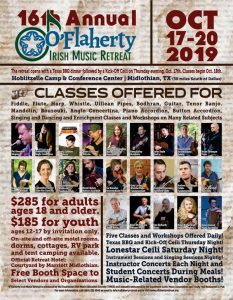 Well worth the travel time and money spent - I learned more about why Irish music sounds the way it does in three days than I ever knew before. Now I have a 'gold standard' to use as I develop my own performing skills with that style of music.